Aquatic plants perform important functions in water gardens and ponds. They will filter nutrients in the water while giving shelter to any fish which are present. Their presence also reduces the growth of algae blooms. However, it is important to realize that these plants must be properly cared for, as their vitality will be reflected in the pond as a whole. The plants will need fertilizer, and the amount you use will depend on the type of plants you have as well as the temperature of the water and the number of plants present. Some pond owners add fertilizer once each season while others do so every two weeks. Whatever you do it is critically important to make sure the brand you use is phosphate free as phosphates encourage the growth of algae. Once the pond plants are fertilized they will grow rapidly and become vibrant in color. While even the best fertilizers are no substitute for gardening knowledge, if you notice your plants die frequently this is a sign that you’re probably growing them in the wrong temperature zone. Some Bog plants such as the Dwarf Cattail must not be completely submerged, while tropical species such as the Antares will not grow well in frigid environments. Doing your research is essential when it comes to plant care and management. Different plants will have different needs and some respond better to certain products than others. Once the plants are growing you can decide if fertilizer is necessary for to sustain them. Fertilizer will give your plants the necessary boost needed to make sure the pond has lots of buds. Fertilizer comes in many varieties, and the type you should use will depend on the plants which are present and how you planted them. Some pond owners like liquid fertilizers, which are mixed into the water directly and will act as a source of food. This type of fertilizer is ideal for ponds which have lots of plants that are scattered. Other pond owners choose to use concentrated fertilizer. This fertilizer is optimal for plants which are potted or which have roots that are planted in the media. You would apply it by pushing the fertilizer inside the media where it will slowly release the nutrients that the plants crave. However, when using fertilizers which are concentrated it is important to read the directions carefully as some brands will burn the plant roots or stem if they come into direct contact with them. Sometimes you will need to divide the plants. This is of particular importance after a long winter. Bog plants can be divided by picking up the container and carefully moving it. 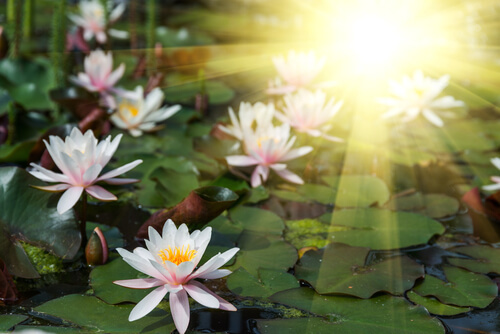 Water lilies, which are tropical and resilient, are one of the easiest plants to divide. After the plants have been split up this is when you will want to apply the fertilizer. This should be done in regular doses.